I’ve been thinking about how my faith intertwines with writing and what such an overlap should look like. In my professional job of programming, I don’t put the gospel into code. I simply write code for whatever functionality is required. There are likely a lot of jobs like this: where the outcome of the product only displays a willingness to do a job well. That can point to Christ indirectly, and as Christians, we certainly should be putting our best efforts forward, but a well-made product doesn’t always reflect the involvement of a Christian worker. How then, does such a thing translate into the arts, specifically writing? Is putting my best effort into a story enough, or should I only write stories for the purpose of edifying Christians or sharing the gospel with the lost? Can I ever write a story simply to provide entertainment? Since the end product can actually show something other than its craftsmanship, should it always point to God? One thing that I feel bound to uphold is an amount of decency. What I mean by that is that it doesn’t seem right to fill a page with indecent material. The specific line I draw on this may not be the same as someone else, but it seems that if I decide not to adhere to God’s direction, I’m likely to follow my flesh into some horrible places. Aside from the decency issue, I feel that the theme shouldn’t go against Christ or the Bible. Perhaps the theme isn’t overtly Christian, but if I write a story with a point of contradicting scripture, how could I be following Christ in writing such a tale? For me, the answer seems to lie in my communication with God. He always influences what I’m writing, and so long as I follow Him, I can know that I’m serving Him with each story that I write. Some stories may not have powerful Christian themes and may seem to be for pure entertainment, but even as such, I seek to provide an entertainment that readers will not feel embarrassed for reading. What kind of a writer I really am will be revealed on that great Day in the future. Of all the critics, I only have to answer to One. My main argument for an annual reevaluation of stories is to promote the highest level of quality in submissions. If you’ve read and applied my entry on getting organized, then time isn’t much of a factor with submissions. Also, if you’re targeting markets that allow electronic submissions, then money isn’t much of a factor either. But what kinds of stories are you pushing forward with your name attached to them? If these are stories written three years ago, they will not show your current skill level (assuming you are improving). You want editors to read your writing at its best, not at its former best. I’ve often fallen into the trap of saying, “Look! I have X stories in submissions.” Is that really an impressive statement? Regardless of what X is, it isn’t the same as saying, “I sold X stories this year.” I would rather have only two stories in submission if I knew that they were both of great quality than have a mixed batch of twelve stories. After a while, it just becomes a distraction, no matter how much you’ve planned out your submissions ahead of time. I know it’s hard to put a story in a drawer knowing it won’t come out again, but that story did advance your skill level by some measure. It was a valuable use of your time, and the next story will be that much better. Learn from whatever mistakes you made with the old story, and move on. My wife recently entered her second trimester, and her profile offers proof that our first child is steadily growing. After I hung up tiny clothes fresh out of the dryer last night and noticed the stroller next to the kitchen, it occurred to me that our household will be changing considerably in December. Though I am thirty years old, the idea of being a father is a still a bit mysterious to me, and I wonder why God decided it was time for me to become one. My wife and I have been married for eight years, and we have a lot of fun together – a strong friendship on top of everything else. Several doctors said that it wasn’t possible for us to get pregnant, and in the years leading up to now, I had come to accept this possibility. It wasn’t that I had given up any hope of having children, but I realized that God was in control, and if He chose for us to continue without children, it was for good reason. Certainly there were difficult moments in thinking children may never appear, but I never felt devastated. Now I find myself imagining life beyond the infant, fast-forwarding to an age when he or she can run and talk and play. More often I imagine a boy, perhaps because I can think back to myself at younger ages (and perhaps because I want to discard the “it” pronoun). I think about trying to figure out who this child is, who God made them to be. If God gives us a football player, for example, I’m currently of little value (other than to occasionally cry out, “False start!” when watching games). And a child who doesn’t want to be the center of attention will baffle me. How will I adapt to that child’s personality and help him to go in his specific direction? To me, this child is not some wish fulfillment, like a box to be checked off on a list of life goals. My mission is to train this child in the way he or she should go. It’s as though I’m being given a stack of materials without any blueprints and asked to build a house. Well, it’s more like I don’t have any blueprints past the foundation (Christ is always the foundation). From that point on, I need to figure out from the house itself how it should go up. And the house doesn’t want to comply. I’m really excited about seeing my child face to face, and I’m equally terrified at the responsibility. Fortunately, I know that God can make up for all the mistakes I’m going to make. I just want to put in the best effort that I can. Adding comedy to works of fiction can serve to ease the tension and pace of a story. When used effectively, stories become more enjoyable. It isn’t for every tale, but if you’re considering how to best add some humor, consider two possibilities: the lighthearted character and the lighthearted observation. The lighthearted character is one that rarely becomes serious, even if his or her life is at stake. Such characters may be humorous just by their appearance, though often it is their dialogue and actions that elicit a laugh. There should be limits to how much such characters should be used at the risk of turning the entire story into a comedy. It might also be helpful in dramatic scenes to see the comedian become grave in manner, letting the reader know just how serious the plot has become. Keep in mind that these characters shouldn’t be overly silly, or they quickly become annoying. Use discretion. The lighthearted observation can come from any character or the narrator, whether thought or spoken. The important thing with such observations is not to milk them; by that, I mean that it is better to say less than more. Suppose, for example (and I don’t mean for this to be funny in the least), that two characters observe a chicken crossing the road. The characters might then look at one another and smile, and this serves the point. A worse approach would be to keep going after the initial observation, perhaps by adding dialogue such as: “Wasn’t that funny to see a chicken crossing the road? It’s just like the joke. I mean, we’re out here next to a road, and now we’ve seen a chicken crossing it!” End the joke promptly; the readers can pause and make additional comments or call their friends about it if they want. Don’t do that for them. The best examples in humor that I’ve read involve characters who are unintentionally funny. I’ve seen this a lot with first person narratives, perhaps because when we tell stories in our own lives, we sometimes fail to see the humor in what we’re saying until others laugh at it. It takes a clever writer to successfully pull off such a tactic, but I think it’s something to aspire towards. Consider the tension of a story as a level of brightness, with darkness being the most dramatic. It takes time for your eyes to adjust to darkness, and adding a comedic punch line flips the lights on full. It will take time for the reader to adjust to more drama, and that costs words. If you want to lighten the mood, instant humor might not be the best solution. Be careful and purposeful. Anyone who seeks publication with their works inevitably receives rejection letters. They come in a variety of shapes and sizes, but there is something to be gained from each one. Keep every rejection letter you receive. If it’s an email, print it out. Keep them in a folder or drawer somewhere near your writing space. It shouldn’t be a monument of spite so much as a monument of progress. This is proof that you are a writer with intent, even if you’ve never seen the light of publication. I can’t even count how many people I’ve run into that talk about wanting their writing published but have yet to submit to a single market. Rejection letters, even form rejection letters (non-specific to the submitter) inform us of a market’s response time. There are sites such as duotrope’s digest and the Black Hole that report response times, so use those in addition to personal experience to get a feel for how long the wait might be in the future. After multiple submissions to the same market, you’ll start to notice a pattern in the rejections. If the pattern changes, pay attention. There was a market that I submitted to years ago that had a form rejection letter where they put checkmarks next to a series of statements about the story. On one such letter they had checked a box next to a line commenting that they wanted to see more of my work. The response to my next submission didn’t have that box checked. Had I shuffled it away without looking at what had changed, I might have missed an indication that one story was weaker than another (at least in their eyes). Celebrate the personalized responses, especially if they come from markets that typically send form rejections. If the editor provides reasons for the rejection, take another look at your story in light of the comments. Before acting on a single opinion, you may want to ask someone else to read the story and give some feedback to see if there is agreement with the editor (this may also help clarify broad issues). I do, however, think it’s better to lean more towards considering an editor’s opinion than ignoring an editor’s opinion. There are other fun things that could be done with rejection letters, such as making giant origami structures or new wallpaper, but that would take another article by itself. For those who already have fine collections going, keep at it. There’s no reason to get discouraged now. If you’re just starting out, don’t worry. You’ll catch up soon. As I continue editing my novel, I’m discovering more about the editing process. Perhaps it’s straight-forward to many writers, but I learn more from experience than anything else, so any forewarnings from others didn’t sink in to the necessary depths to actually affect me. As I reveal what I’m doing now, I can only hope that it benefits someone else, either as revelation or affirmation. After what should be a very open and free first draft where the mind wanders about the page, the drafts that follow should be written meticulously. The story is out, but it’s going to be in sloppy form. I like to use the second draft as a time to methodically go from paragraph to paragraph, looking at the wording and overall feel of what is written. This is the place where major changes take place. Entire paragraphs are struck down by my backspace key. Just as the Cobra Kai sensei teaches in The Karate Kid, “Mercy is for the weak!” Even if a sentence is ingenious, it needs to go if it gets in the way of the story. If the idea within a series of poorly written paragraphs should be retained, rewrite them. I like to just give myself some open space right there on the page to try a few alternatives and see what grabs me. As long as I’m patient and honest with myself, I know I’ll fix the problem. Editing takes a focused mind and a cold heart. It’s still art, but it’s ruthless and determined. Leave no sentence unread, question each transition and shape that lump of a story into something memorable. Last week, I picked up a new certification from Microsoft by passing the second and final exam required. The certification is MCTS (Microsoft Certified Technology Specialist): .NET Framework 2.0 Web Applications. It’s a lengthy title, but it’s also very straight-forward about what the certification covers. The “computer programmer by day” side of my life focuses on web development primarily. This certification is one that I’ve been studying and working towards for the past six or seven months. I can’t express the relief and joy I felt at the moment I saw the screen display my passing score. Writing time became certification study time on weeknights. It was a difficult decision, but ultimately my responsibilities towards my programming career take precedence. With the certification in hand, this frees me up much more at night to resume writing projects that had shifted to weekend only projects. Most published writers have day jobs, and sometimes it can be frustrating to push aside the writing that we love in order to meet the demands of our first careers. I’m posting this update not so much as a brag but to encourage writers that it’s okay to sometimes minimize writing for the right reason. Just be sure that there is a right reason. Third Person Narration: Friend or Foe? I struggle more with third person narration than first person. Third person disguises itself as a simpler style (at least it did to me), removing the limits found in first person and allowing the writer to keep the narrator’s voice neutral. There is, of course, a danger in oversimplifying anything with writing, and I drifted inadvertently into a minefield. Omniscience. This is an awesome power for the narrator, but I’ve found that it can easily wreck a story. Unfiltered character thoughts can flood a page and kill suspense. When I used this poorly, I left nothing to the reader’s imagination. My narrator told them everything, to the point that there was no reason to continue listening. A better strategy for me was to limit the text to one character’s thoughts, at least within each scene. The narration then picks up some of the attributes of the character, giving life to what might otherwise lack personality. Besides revealing the nuances of all my characters, my third person narrator had a terrible habit of showing too many details. A room became cluttered with so much junk that the story became an inventory list. It was like I was writing a play, and I needed to give direction to the stage crew. My solution for this was to be subtler, to show only what needed to be shown and to reveal bits and pieces as the story unfolds. A final problem (among many) with my narrator was that he was simply too busy. Sentences contained too many adjectives and adverbs. Minute actions became paragraphs. He needed to be succinct in order to tell the story effectively. I will always prefer to err on the side of too many words than not enough, but my narrator is not nearly as verbose as he once was. The old adage is true: some things are better left unsaid. The narrator should work for you, not against you. Don’t let him or her become a loquacious monster of infinite knowledge. Write yourself detailed notes if you must, but limit third person narration to the story and its purpose. This is, after all, your story. Last year, I began watching Naruto. Shonen Jump’s Naruto series is an anime cartoon and manga (essentially graphic novels or comic books). I’m not someone who watches much anime, but this show has quickly become my favorite, edging out Veronica Mars by a small margin. The show mostly focuses on the life of Naruto, a young ninja who grew up as an orphan. Not only did he feel the rejection from not knowing his parents, but he was also cursed in his infancy to hold the spirit of the Nine-tailed Fox, a powerful entity that nearly destroyed their entire village. Naruto seeks the respect of those in his village and desires to grow through the ninja ranks in order to one day become Kage, the leader of the village and most powerful ninja. Naruto (the series) does several things very well that impress me as a writer (and draw me back each week). The characters are strongly developed. Each one is quite unique, and they also change over time. Often as background stories unfold, I change my opinion on certain characters, proving that the flashback sequences not only integrate into the storyline, but they also impact character development. The fight sequences are another indication of brilliance. Aside from the fact that the good guys don’t always win, the fights include a great variance of techniques that keep the viewer guessing as to the outcome. The ninja go beyond real-world combat and employ special jitsus based around the fantastical power of Chakra. As the spars draw out, the ninja employ various strategies with their jitsus, adding intelligence to what would otherwise be chaotic. I really enjoy the progression of the series. It continues to build momentum, and as Naruto gains experience, the plot around him becomes much more serious. The writers have the ability to continue escalating the plot without artificially inflating it. The episodes flow quite well. A final point that kept me interested early on is that the writers established my trust. With any kind of detailed fantasy storyline, there are going to be items that a reader/viewer cannot grasp. The writers of Naruto realize this and bring in dialogue to assure us that all we be explained later. For example, one character may begin using a new type of jitsu that causes all sorts of strange things to happen. Usually, a lesser character will say, “What’s that? What’s he doing?” This vocalization of my thoughts through another character lets me know to be patient. And the writers have never failed to explain a critical point, sometimes recapping certain items (probably for newer viewers). For anyone who may be skeptical about a show like Naruto, I will say that it’s difficult to watch one episode and understand anything that’s happening. It’s better to watch a few episodes or, better still, to watch the first season. If you are a writer, consider watching the show (or reading the manga) as an example of good writing. This show isn’t popular by accident. I have nearly finished reading an incredible book that has been an enormous blessing to my understanding of writing. The First Five Pages: A Writer’s Guide to Staying Out of the Rejection Pile by Noah Lukeman reveals the mistakes writers make and offers solutions to these problems. The book would be valuable to various levels of writers, and I plan to reread parts of it every few months in order to catch myself as I continue to progress in skill. Written from the perspective of editors and agents, Lukeman shows how they can identify poor manuscripts within the first five pages (or sooner). Most of the principles he highlights should be considered for novels and short stories, but some principles could apply to other types of writing as well, such as journalism. No matter how aware you may think you are of these bad traits, you will probably find something you hadn’t considered, and your manuscript probably reeks of that error. Each chapter contains examples of the issues and offers suggestions for each. There are only a few pages to each chapter, and though they make for a quick read, applying the principles takes longer. At the end of each chapter, Lukeman lists a number of exercises to help solidify what you’ve just learned. Just like any other taught skill, you probably won’t grasp the concept unless you apply it. I strongly recommend this book for those who are looking to improve their writing but may not have time or money to attend classes or seminars. Certainly there is no replacement for having someone read your work and personally comment and coach you, but this book should help you identify some mistakes on your own. Using this book in combination with volunteer readers could really make a dramatic improvement. We need the right tools for the right job. Anyone who has tried to tighten a screw into hard wood using only a screwdriver understands the difference that a drill can make. As writers, we need to consider which tools will help us the most with our craft and have them at the ready. A dictionary may seem like a superfluous item to some, but this basic tool offers us the true meanings of words. To misuse a word can ruin an entire sentence. Also, as we come across a new word (I find most of my new words through reading), we can evaluate its meaning precisely, rather than rely on contextual clues. When I first heard of using a thesaurus as a child in school, I was hoping I was about to access some previously unseen beast. I was disappointed to find out that it was another thick reference book that seemed just as boring as a dictionary. As a writer, however, I find the thesaurus to be invaluable. Now, if I’m in a rut of using the same word again and again, I can look up some synonyms through the use of my trusty thesaurus. Don’t skimp on obtaining a good thesaurus, even if you have a high vocabulary. You may find that your mind is locked around a certain word and refuses to think of a substitute. Unleash the thesaurus! A final tool candidate that some may oppose is a stylebook. In our days of creative arts, the rules of grammar and punctuation seem like shackles at times, yet they are the rules that bind us to English rather than Your-glish. I realize that even among the grammatical guides, there are discrepancies, and depending on the edition, there are further discrepancies. Even with all the disparity, it’s wise to reference something as an absolute for the sake of consistency. My personal choice is the Chicago Manual of Style, but I wouldn’t defend it to my death; it’s just what I use. Take inventory of your tools. There are others beyond these three, but if you don’t have access to all of these, shop around to see which versions might interest you. Head into a bookstore and try a few out on the spot. Once you’ve purchased your favorite reference books, keep them in a handy location, like next to your computer. Your spouse probably doesn’t want them in a pile in the corner of the bedroom. After many weeks of waiting with great anticipation, we have at long last purchased a Wii, thanks in no small part to the efforts of my wife, who often searched for one and at last ended up at the right place and the right time. Not only do we have the system itself, but we’ve also got four Remotes (or Wiimotes), two Nunchucks and an assortment of games. Of all the games that we own for the system, my favorite is The Legend of Zelda: The Twilight Princess. I enjoy the simple puzzles of the game, like figuring out how to open doors or where to find certain items, but there’s also the game-play aspect. With Zelda, you are swinging your arm to wield Link’s sword, yet the movements of the character are accomplished through the familiar turns of a small, thumb joystick on the Nunchuck controller. I don’t know if I would rank this Zelda as the best ever (though the technical achievements of this game are the most advanced) because I can still recall the days when I played the original Zelda on NES and The Legend of Zelda: A Link To The Past on Super NES. Both of those games were remarkable in their days, and I can’t just knock them out of contention because their graphics are less or because they’re flat, 2-D games. The myriad of uses for the Wii controllers becomes apparent with Wario Ware: Smooth Moves. This is a game of utterly ridiculous mini-games, such as shredding a cell phone, helping Granny put her false teeth in or washing a cow. The entertainment is just as much in laughing at the overall silliness of each mini-game as it is in successfully completing it. Another feature of the Wii is that it allows users to create cartoonish characters in their own likeness (called Miis). Users can then play as their Mii in some of the games, such as Wii Sports. This is taking “Enter your name” to the next level. The Wii is the most innovative game system to date. When connected to the Internet, it allows for downloads of much older Nintendo games (though at the moment there are only a few titles available), displays weather forecasts and allows you to share your Miis with other Wii owners (you can even have parades of all the Miis that have come into your system). For those on the fence about getting a Wii, I highly recommend it as a fun video game system, regardless of whether or not you have any skills at playing video games. If you can move your arms, you can play the games. Some games might be too challenging for newer gamers, so use your own discretion. I like the heavy rapier because there’s more to it than a foil or epee used in fencing. It’s a sword with a flat blade around three feet long, and there’s a finesse in using it that isn’t found with a broadsword. The flat part of the blade stays parallel to the ground as you use it. An instructor told me this was so that you could more easily shove it between a man’s ribs. I’d like to think that there’s more of an appreciation in being slain by a rapier than by a broadsword. With what little I know at this point, if I were dealt a fatal wound by my enemy’s rapier, I might utter, “Well, that was very skillful, Bill.” Bill wouldn’t get that kind of a comment from me if he came charging up like a barbarian, wielding a two-handed Claymore, and swooped my head clean off. Below is a picture of my practice rapier. The end is deliberately blunted since it is only used for practice. I certainly don’t want to injure a sparring partner. 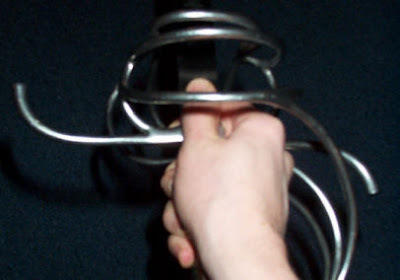 According to the video series, there are several ways to hold the rapier, and my preferred method is to split my index and middle fingers over the cross bar, curl my index finger beneath and rest my thumb on the flat part of the blade. This seems the most natural to me, but I may be an outcast for taking such a grip. Again, I am a beginner, not an expert. One thing that becomes apparent after a short time is that my muscles are not naturally developed to hold a rapier. The muscle that runs along the top of my forearm seems the most distraught whenever I practice. I’m getting more and more used to the weight, especially as I supplement my sword training with weight lifting exercises that specifically target that muscle group. Eventually, I hope it feels very natural to pick up the blade and use it. It will probably take me quite some time before I am able to spar for any length of time, especially if I was actually competing against my sparring partner. I don’t know that I ever want to take it that serious, but for now I’m having a lot of fun. I just hope Bill isn’t practicing, too. After identifying your world’s origin and building its physical structure, it’s time to think about life. What kind of life exists in your world? Leave out the dominating species for now. They’ll come into play later. Given the physical state of the world, peer at each climate and identify what organisms inhabit it. If it’s water, think about the fish or other aquatic animals that swim or lurk about. For land, imagine the plants, animals and insects interacting with one another. I strongly advise against recreating every living thing on Earth in a new way. If your world is close enough to ours that it supports very similar species of plants, animals and insects, why do you want to teach your readers a course on biology based around this new set of creatures? Stick with the same animals we have in our world and maybe add a couple more just for fun. I can remember the names of a few new critters, but if you pelt me with a grocery list of animals that one of your characters discovers, I won’t remember any of them. One exception (and even then it’s best to limit how many species are introduced) is if you don’t want the reader to think of Earth in the least way. Perhaps microorganisms also play a role in your world, and if so, have fun creating all of that. I know very little in the field of biology, especially microbiology, so I have little to contribute on the subject. If microorganisms aren’t essential in your story (or stories), however, I wouldn’t give them a second thought. How much you want to identify predators, prey and the interaction of all life forms is up to you. It’s simply a matter of plausibility. The excuse of, “But it’s fantasy!” only goes so far. There has to be some give and take with your readers. If you don’t explain how 200,000 lions live on an island without any other visible sources of food, your story might come across as weak. At least give us a clue about those lions because that’s going to bother some of us. Having a character stumble across empty cans of tuna on the island would at least present a different dilemma. Now that your world’s origin has been determined, the next logical item to consider is the landscape. This is a global-level plan for the world and its existence. Think of extreme gardening. It’s time to make some maps! Maybe it isn’t necessary to draw the fine points of every square mile on the planet, but take some time to daydream about the view from a plane (or dragon). Consider the world’s origin as you design it. One other point I will add before you break out the crayons is that it should be determined how fantastical the world is. Streams running through clouds or lakes of honey can work, but only if everything else matches as well. If your fantasy world has a structure that we might associate with our own planet, it becomes more difficult to break the laws of physics without coming across as silly or ignorant. Invite the reader to laugh with you, not at you. Think of the resources available to different areas in your world. This will help determine where civilizations or fantastical creatures may live. Are there some lands that are uninhabitable? If so, why? Remember that this is all clay; it’s malleable. If things don’t seem right, tear up that map and start over. The purpose of building the world is to give it depth, but if some of the details interfere with telling a story, change those details.